Hi guys, Have your ever lost your valuable data? If not then you don’t know how sad it is when lose your important data. I have been through this data loss and have searched many software’s to recover my lost data. But nothing fulfilled my requirements. I was searching for a software where it recovers almost all the data from any media and any format with simple interface and good speed. I found all of these requirements in a newly launched software known as NextBreed Data Recovery. You can access your lost or damaged files immediately.Lets take a brief look at the software today. What is NextBreed Data Recovery ? Image Files like JPEG,PNG,BMP,JIF and Etc. Sound Files like MP3, WAV, WMV, ASF and Etc. Movie Files like AVI, MP4, MPG,RMVB, and Etc. Office Files like Word, Excel, PowerPoint and Etc. Apart from these files it can store what ever you want like Temp files and even thumbnail files. How to use NextBreed Data Recovery ? Using NextBreed Data Recovery is really simple and also the process time of searching a file is really fast. I wondered seeing its performance. It really take very less time to find out what files were deleted previously and recovers them even more faster way. I will give you a step by step guide below so that you can understand how to use NextBreed Data Recovery easily. Each of the above process has its own method of extracting data with maximum speed. You will be surprised to see the access time of the recovery which is being processed. Now let me explain each one of the recovery tools. 1) Just click on the Deleted Recovery icon which will bring the Deleted Recovery panel. 2) Now you will be shown a list of drives or partitions available in your system where you have to select for which drive you want to do recover the data. 3) As in the above screenshot you can see a two hard drives with different partitions in it, i am selecting the G drive which had some audio album which i deleted long back and now currently have some videos. Now just select the drive and click on Next. 4) After clicking on Next you will see a fast processing bar which completely scan the disk and gives you the list of files which were lost. As you can see i have recovered a whole album which i deleted permanently from my harddisk on 8th of May 2011. But even after 25days the data can be recovered very easily and completely with the help of NextBreed Data Recovery. 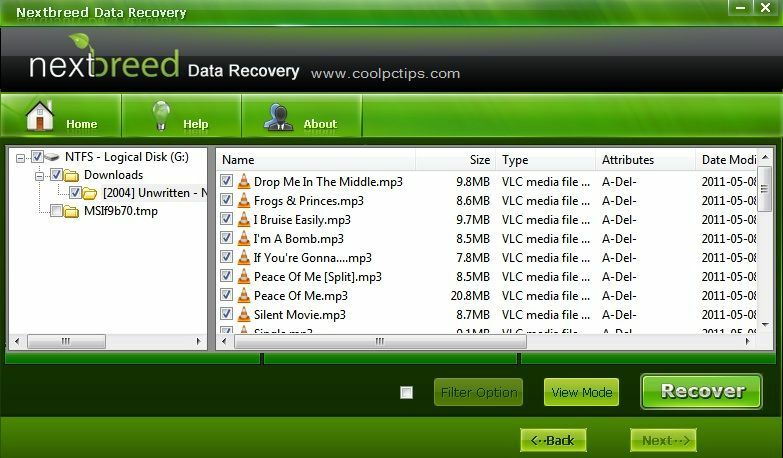 5) In the last step, now select the files which you want to recover and click on Recover Option below. It will ask you a path to store the data. Just create a new folder on desktop and click on Ok. Now you can get access to your lost file easily. 6) You can also use the Quick Search option in point 2 above to get the quick list of deleted files. also you can set filters where you can set specify certain file name or type. 7) That’s all with Deleted Recovery option. 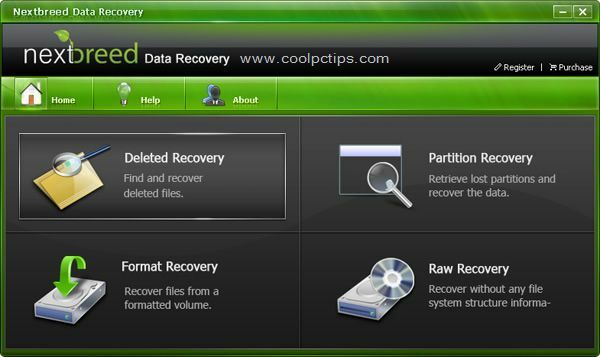 Partition Recovery is a awesome option to recover your lost partition. If you have ever lost a partition in your hard drive, you can get it back in minutes. Just follow the simple steps given below. 1) Just click on the Partition Recovery from the NextBreed Data Recovery home panel and you will bring you the Partition Recovery panel. 2) You can see your list of partition available there. Suppose you have lost your some Drive recently because of some system crash or virus. 3) Now go to Partition Recovery panel where you can see Auto Scan option. Now double click on it to get the list of partition. 4) Now you can see a list of partitions of your drives which are available right now. 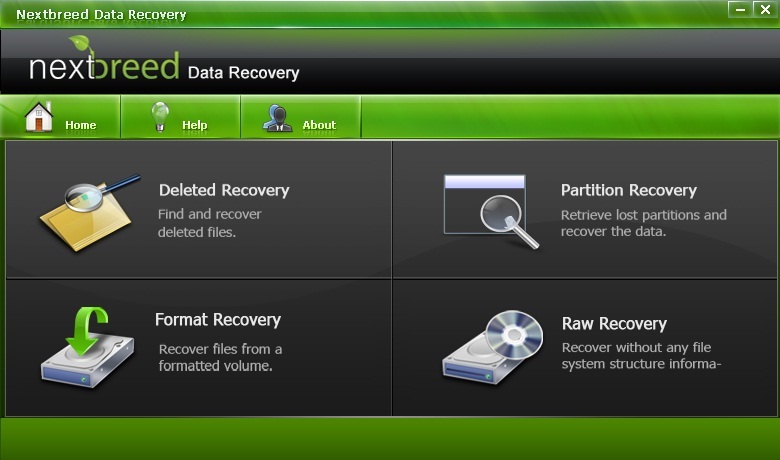 Now select the drive which you want to recover and click on recover. 5) Now Click on recover which will bring a popup box saying This Operation is very dangerous, Are you sure to Continue ? press on Ok to continue. 6) Press on Ok and where it will take some time to recover the lost partition. It will ask for a restart, just press on yes when it pops up you to restart your system. 7) Now your partition is restored and you can use it the same way when it was before corrupted. These two recovery options are very important for any common users like me. The NextBreed Data Recovery has two more options called as Format Recovery and Raw Recovery which are exactly similar option as explained above. But i will explain you what exactly Format Recovery and Raw Recovery are. Format Recovery : You can recover a file from a Formatted Volume in just fraction of Seconds. Just select the Format Recovery option in NextBreed Data Recovery and select the drive which you want to recover and click on Next. A process will appear where it will scan the entire volume when it was formatted and all. It will give a list of files which have been deleted from the previous format and you can recover them just like that. Here in the above screen shot i have selected my G drive which i formated long ago. Now as you can see a list of files which are being recovered and also see the file Unwritten album which is below the Pitbull song which is being recovered. The unwritten album is the album which we tried to recover in Deleted Recovery. The very first option in the article.Now just select the file and click on Recover to get the file back. Raw Recovery : Now coming to the Raw recovery, this is used mainly to recover file without any file system structure information. 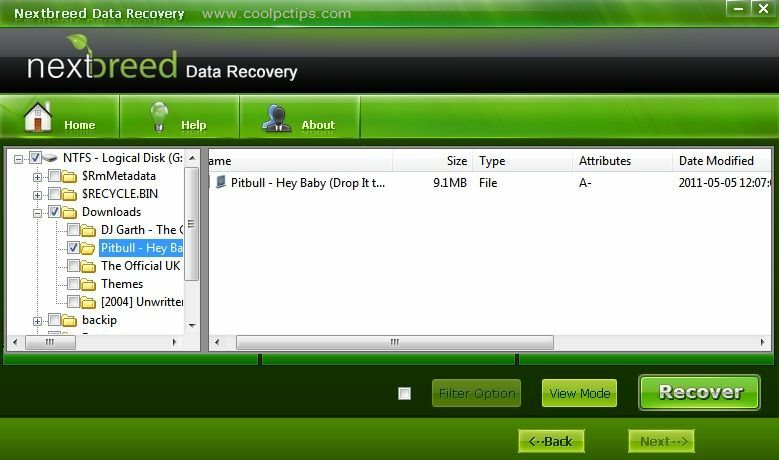 Just select the Raw Recovery option in NextBreed Data Recovery and select the drive which you want to recover and click on Next. A process will appear where it will scan the entire volume and gives you access to recover the files which you have lost. I hope you have learned enough of NextBreed Data Recovery. Now its time to download it and use it straight away. The software is shareware where you can try the trial version to recover the files. Announcement : You can buy the NextBreed Data Recovery Software for a discount of 15% if you are coolpctips readers. Just go to Order Page here : Order and enter the Coupon Code as NEXT-CKXD. The offer will be available only for 30days so rush to the Official site to buy the NextBreed Data Recovery. Its better you first download the trail from below link and test it, use it and then buy it if you are satisfied. I bought one for myself. Because my data is important to me, not money. Say no to warez and illegal software’s. Just buy the product to support the company. I hope you liked the post, if you have any queries please don’t hesitate to ask me. Utilize the 15% discount from our site. Thank you guys. sounds interesting application. will try to recover if i lost any important data. btw thanks for share. thanks for explaining each and every step in a detailed manner so that users can understand the procedure for recovering the lost data. I’ve had lots of error and bad or damage HDD I’ve set aside hoping I could find a software that can really restore error or damage hard disk hope this software can do do the job for me…. I Think its corrupted completely.. Try to recover it by default option… Try to format the drive first with NTFS option. and search for bad sectors and put the option as automatically fix errors. still didnt worked out ? then dont worry, you can replace it easily….